Grist’s David Roberts sent out a Tweet to his Tweeps today asking which city has installed the most solar. I’ve got an answer for you, David: Nipton, California. The solar system is ground-mounted rather than on rooftops and only generates 82 kilowatts. But what is notable is the technology developed by Skyline Solar, a Silicon Valley startup I first wrote about for Grist last year. The company’s power plants resemble solar thermal parabolic trough installation that deploy long rows of mirrors to heat tubes of liquid suspended over the arrays to create steam that drives an electricity-generating turbine. Skyline’s system is purely solid state, however. 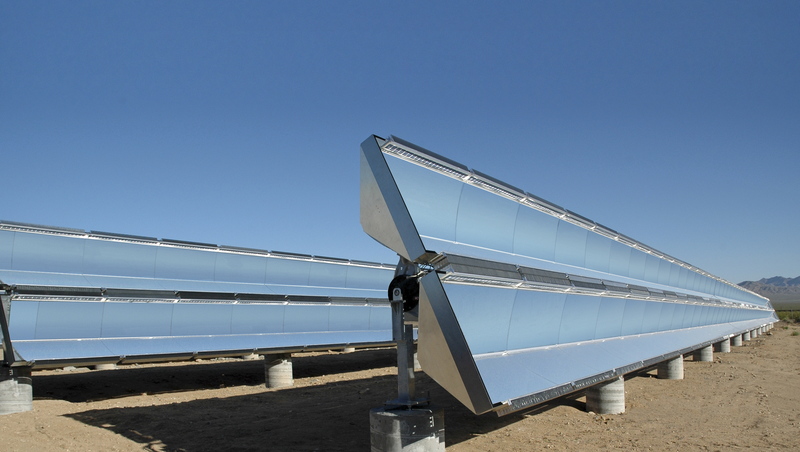 Each 120-foot-long trough concentrates the sun on photovoltaic modules attached to the edges of the arrays. That boosts the solar cell’s electricity production as does a tracking mechanism that allows the arrays to follow the sun throughout the day. Such concentrating photovoltaic systems – which Skyline calls “high gain solar “ – have been a niche market due to their relatively high costs. But as solar cell prices decline and solar thermal projects get bogged down in environmental disputes, they have become increasingly attractive as they can be built near utility substations and plugged directly into the grid without the need to build expensive new transmission systems. Skyline has pushed to lower costs by using common materials – glass, steel – and designing the arrays so their components can be mass-produced by automotive manufacturers. The company last year struck a deal with the Michigan subsidiary of Canadian auto manufacturing giant Magna International to make components for its HGS 1000 solar system. In other news on the solar frontier Thursday, Silicon Valley startup MiaSolé said the National Renewable Energy Laboratory had confirmed that the company’s copper indium gallium selenide solar cells have 13.8 percent efficiency in production. Such thin-film cells typically have a lower efficiency than standard polysilicon solar cells but are cheaper to manufacture. But with an efficiency approaching 14 percent, MiaSolé could give some standard module makes a run for their money.